Delightfully decorated Pradera brings a slice of Spanish warmth and hospitality to Hornsey. With its bright and colourful interior and welcoming atmosphere Pradera presents all things Spanish in an authentic setting with flavours as vibrant as the Spanish sun. This tapas bar and restaurant is an ideal venue for a group of friends looking for a really fun night out with the candlelight atmosphere adding a touch of tranquillity. On entering, you will find the bar with a vast array of drinks displayed. 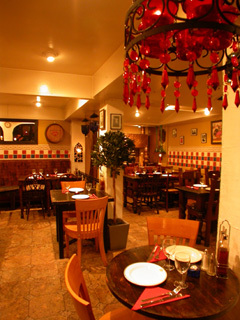 The dining room is kitted out in a combination of bright Spanish Picture’s, tiles, furniture and decorative ornaments. Visit with a peace of mind that you are never rushed to finish, so sit back and enjoy good food with good friends. Very friendly and helpful staff. After many years of serrving the Hornsey crowd, this restaurant seems to have established itself as one of the best choices for eating out in the area. Pradera however has proved that it is more than a local convenience with some customers travelling long distances to enjoy its culinary expertise. There is no private room available, but groups can dine together in the main dining room or the secluded back area. The restaurant caters for birthdays, weddings, anniversaries, promotions, hen parties and will bring some buzzing Spanish energy to your special event. Next Flamenco show is on Sunday evening 10th of November. Wine tasting event on Tuesday 23rd of April at 7.30. Mon-Sat 6 pm. to 11 pm. The distinctively Spanish menu is evenly split into tempting sections of tapas, salads, fish and seafood, meat and rice dishes. It offers a wide variety of tempting vegetarian dishes and an extensive range of tapas. There is also a good choice of seafood as either tapas or main course. An attractive selection of Spanish wines, traditional spirits and Spanish beers alongside some carefully selected New and Old World favourites. Sangria and Mojitos are of course on the menu.